Still from In Jackson Heights. At rep cinemas this week: an absorbing documentary about one of the most diverse neighbourhoods in the United States, a bloated gothic romance, and a stately martial arts drama. Wednesday, November 25, 7:30 p.m.
Frederick Wiseman brings his unobtrusive but keen eye to one of the most ethnically diverse districts in the United States with the characteristically absorbing and trenchant documentary In Jackson Heights. 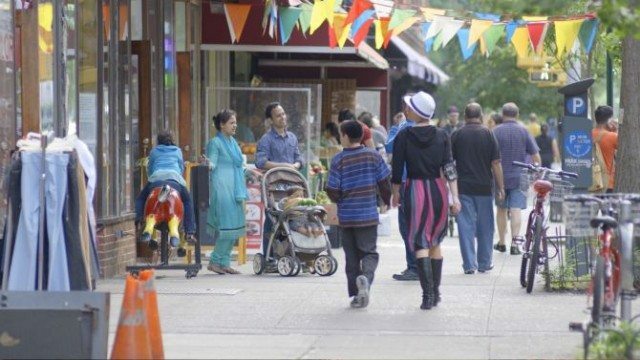 A neighbourhood in the northwest stretch of Queens, Jackson Heights serves for Wiseman as a microcosm of America itself, a place where, despite the systemic failures of federal governance, grassroots organization and community problem-solving thrive and forge connections across disparate cultures. Wiseman has always been attracted to the way institutions either succeed or collapse on the strength of their group mechanics, and Jackson Heights’ many LGBT activist groups and community outreach programs give him a nice cross-section of subcultures with which to work, as well as some dynamic stars who pop out of their often dispiriting settings. Despite the film’s length, which is admittedly daunting due to the occasionally draggy pacing, there’s an ebullient energy to some of Wiseman’s seemingly tangential but actually critical asides, including a detour into a tutorial for cab drivers and a painful but illuminating look at the drudgery of answering phones for city councillors. One’s mileage will no doubt vary here based on one’s interest in urban planning and municipal politics, and at times, the film undoubtedly lacks the focus of Wiseman’s more structured institutional cross-sections like the recent At Berkeley. But this is essential viewing for anyone who cares about the way American values are either built up or cracked from the ground up. Del Toro is an erudite, well-intentioned filmmaker, and it’s no wonder that he has made a name for himself in recent years as an amateur film scholar, a wealth of knowledge on everything from the gothic to Hitchcock who delivers master classes, commentaries, and Twitter essays on the same. The trouble is that that’s the mode he’s working in here, too, pedantically citing gothic trope after trope without putting them to any use. Worse, del Toro wastes a perfectly game cast, stranding valuable players like Hiddleston and Chastain in the back of the gorgeous, collapsing scenery. They’re left to spout his usual bromides about the ethics of caring for the monsters in your backyard, but if del Toro can’t be roused to care about anything but the house’s impressive set design, why should we? 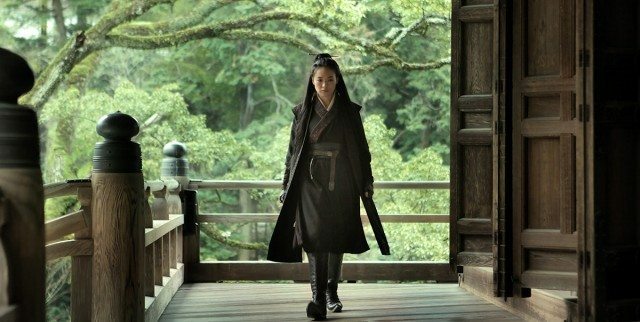 Taiwanese master Hou Hsiao-Hsien returns after a long delay with The Assassin, a gorgeous if obliquely structured historical epic set in the waning days of the Tang dynasty. The director’s first wuxia film–genre of Chinese fiction focused on martial arts–tells the story of black-clad professional killer Yinniang (Shu Qi), who’s assigned to put the hit on a military bigwig from her home province of Weibo. Easy enough, though he happens to be her cousin and former betrothed. Suffice it to say that soul-searching and precisely choreographed combat ensues. Hou is a deliberate storyteller, fond of syncopated rhythms and impressionistic imagery, all of which makes The Assassin rather idiosyncratic as a martial arts film. Though his earlier films like Millennium Mambo and Three Times easily stand among of the best of the 2000s, we’ll confess to being a bit flummoxed by this one, a ravishing but dramaturgically bumpy film, which occasionally lost us when it navigated the hostile waters between Weibo and the Imperial Court. Like all of Hou’s films, this one rewards patience, namely in the startling, punchy bursts of colour and naturalistic sound that constitute the blink-and-you’ll-miss-them action sequences. Our failures of attention are probably on us, but one wishes there was more here of Hou’s delicacy in capturing the minute pains and pleasures of human relationships, and less of a reliance on cyphers. Still, you take beautiful work like this where you find it.